Locally only the name Maolchnoc is used according to Tim Robinson, while the anglicised name Garraun marked on OS maps is no longer in use. There are several other hills in the area where the same discrepancy can be observed: Binn Fraoigh/Altnagaighera, Letter Hill/Tully Mountain. Garraun is clearly also a name of Irish origin. It may either be from Ir. garrán, 'grove', or, more likely, from Ir. géarán, 'fang'. 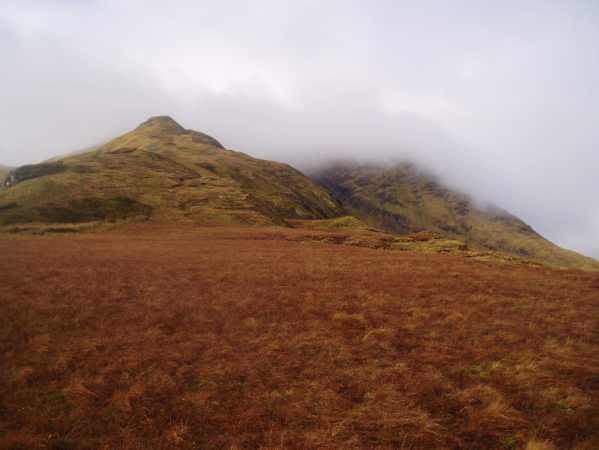 The summit is flattish, but the eastern ridge leading to it is sharp enough to have deserved this name. If this suggestion is correct, the anomaly of two different Irish names for the peak is only an apparent problem, not a real one. The name Maolchnoc would aptly describe the rounded summit, while An Géarán would denote the sharp ridge descending to Lough Fee. Walks: see Paddy Dillon, Connemara, for routes approaching from the SE (45-50) and the NW (51-56). Garraun is the 293rd highest place in Ireland.